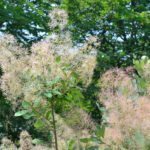 I recently planted a small smoke tree but am concerned about its poisonous seeds and that it is a member of sumac family and might cause skin irritation. I read this in an article on the internet. My daughter visits often and brings her dog. Is this a great danger to pets? There was no warning about this on the tag found on the tree when I bought it. Are all smoke trees dangerous to pets or certain types? Help!! Yes, the seeds and other parts of the tree are poisonous. However, it is unlikely that the dog will be eating it. Still I would recommend keeping the animal away from the tree. One way to accomplish this is to place fencing around it whenever the dog is expected to visit so he will be unable to get close enough to the tree.